Photo courtesy of Dakota Beef. 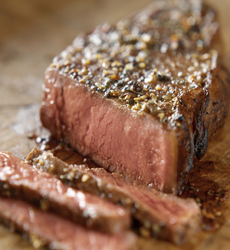 Read our article on organic and specialty beef. beef and buffalo recipes and more. Learn about "the other white meat" in our Ham Trivia Quiz. ANSWER: The Kobe Prefecture in Japan, where the cattle were first raised. It is true that the cattle are black haired, but the breed is called wagyu, which is what the beef is called in the U.S. Because of import restrictions, true Kobe is not currently available in the U.S., but domestic ranchers are applying the practices and selling wagyu beef from the same breed of cattle. Savvy Kobe beef marketers led people to belief that the cattle were pampered, massaged and brushed with sake and fed beer-and-sake mash to create the exceptionally marbled and tender beef. That may have been true with the original small herd, but large-scale production soon made that kind of treatment unfeasible. Basketball star Kobe Bryant was named after the beef, a favorite of his father's. What cattle eat has an impact on the flavor of the meat. Grass-fed beef looks, smells and tastes slightly different from grain-fed beef. Grass-fed cattle are free range, grazing except in the cold winter months when their diet needs to be supplemented with feed. They have about half the fat of grain-fed beef (the meat has less marbling), plus omega-3 fatty acids and significant amounts of conjugated linoleic acid (CLA), a potent anti-cancer agent. Grain-feed beef has a nuttier flavor from the corn in the feed. Before World War II, virtually all cattle grazed on grass. Postwar agribusiness, aided by federal subsidies, produced huge surpluses of corn, which found its way into animal feed. So, healthier beef or more flavorful beef: take your choice. Prime beef is the top of the eight classifications of beef, followed by Choice, Select, Standard, Commercial, Utility, Cutter and Canner. The grading is based on three factors: the proportion of meat to bone, the proportion of fat to lean and overall quality. Beef grade is largely determined by the genetic nature of the steer, although the industry tries, through breeding and feeding practices, to raise cattle that will earn a Choice grade. ANSWER: Specialty butcher shops and fine restaurants. Prime beef is generally only available to specialty butcher shops and top restaurants, because there is so little of it. Only 2% to 3% of all beef produced is graded USDA Prime; about 58% is graded USDA Choice, which is the best quality available at supermarkets. Supermarkets also sell USDA Select, and lesser supermarkets will sell Standard as well.